On Saturday, November 3, 2018 Deputy Gott, of the Calvert County Sheriff’s Office conducted a traffic stop in the Wendy’s parking lot in Prince Frederick. The occupants were asked to exit the vehicle and a K9 scan was conducted which resulted in a positive alert. A search of the vehicle revealed three hypodermic syringes and a metal spoon containing suspected heroin residue. The driver, Gary Wayne Leslie, 42, of Lusby, was placed under arrest and transported to the Calvert County Detention Center where he was charged with a traffic citation for operating unregistered motor vehicle on highway and CDS: Administer Equipment-Possess/Distribute. This entry was posted on November 7, 2018 at 9:27 am and is filed under All News, Calvert News, County, Law Enforcement, Top News, z 600X120 Top Ad Bottom, z Police Ad Top. You can follow any responses to this entry through the RSS 2.0 feed. It’s Bam Bam Bigelow. Celeb siting. He already won. He’s in the top 1% of the biggest losers in calvert. Why do people really think the thug life is so cool? I don’t get it….. Assume he does not represent the University of Maryland! So, no “Go Terps”? Dang it! This fine young man has 97,yes 97 charges against him over the years.Case search him.What a drain on society and the taxpayers.Why do we have to keep paying for scum like this? Vote REPUBLICAN. This guy IS a republican. LOL. And, of course, remember to call yourself a “Christian”. Some posts require an interpreter. It helps with those who never have graduated beyond texting. Wow! A Maryland graduate to boot. Didn’t see it coming. I KNOW this guy has won the award – without even looking at any other contestants. How did a creature like this come to be? Did it crawl up from the Cypress Swamp? Was it nuked by Calvert Cliffs plant? Put it in a cage and ship it to Jessup zoo. Why don’t you ask him? Oh that’s right you would never even have the ba##s. What if he did? Would this fine upstanding citizen assault him? My guess is he probably would as this dude obviously looks like he has made great decisions his whole life. 42 years old and still has not grown up. No chance for improvement with this one. I. Can’t. With. This. One. 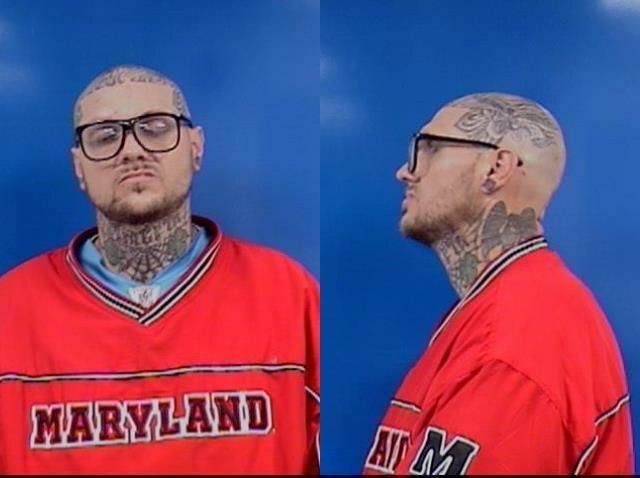 Ladies and Gentlemen, the next President of the United States, Gary Wayne Tattoohead! I be laying there dead. Till I’m face-down in the woods – with a hyper in my arm. Dang…you gotta be on something to look like that. 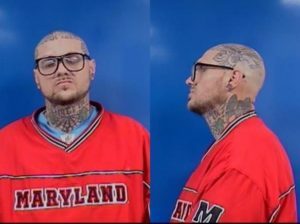 Come on..he looks like a total upstanding citizen who will make it so far in life with all those neck and head tattoos!! Smh! Go t rehab and then seek laser surgery cause u look a hot mess! It is obvious that this guy has made good decisions his whole life! Rock in dude, don’t let the haters bring you down. It’s your neck and head and can do as you see fit! So its ok for him to do Heroin? This guy caused a lot of problem for my brother. Pray for him! Pray for him or your brother? Better than a Hillary Zombie. Your half brother? Deal with it. Has over 90 citations on case search.Why are we paying our tax dollars to people like this? Surprising the police didn’t see the “criminal indicators” as they do with other upstanding citizens. He’s a very artsy fartsy kinda guy! Haha- If I could +1 this comment I would! Eww just ewww! Scary looking creep! Is he a part of the Witness Protections/Relocation program? Get the trash off the streets. How could any SANE person do that to themselves? This guy is out there. Jail is the prefect place for the displaying of his tats. Even without 90 some charges, this is one scary lookin’ weirdo. No…just one cheezy looking weirdo.